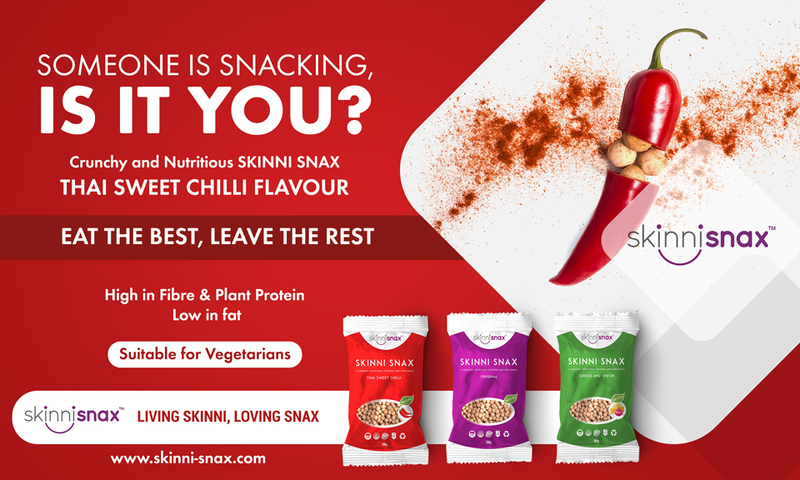 SKINNI SNAX is high in fibre and plant protein, low in fat, SKINNI SNAX is the perfect, healthy snack. These crunchy and nutritious balls are doubled baked, chickpea and soya, with a crispy, outer biscuit crunch. Most of us are snacking on the go and seeking convenient, healthy snacking. SKINNI SNAX is healthy and suitable for vegetarians. With our fast-paced life style, more than 60% of consumers consider health as a key decision maker for the purchase of snacking. SKINNI SNAX: Someone is snacking, is it You? Details: Buy SKINNI SNAX, a revolutionary chickpea and soya, healthy snack. High in fibre and plant protein. Low in fat. Available in 3 flavours: Original, Thai Sweet Chilli and Cheese and Onion. Buy our sample pack of all three flavours for 2.57 gbp with Free Shipping. Crunchy, nutritious, healthy snack. Eat the Best and Leave the Rest. Visit our website www.skinni-snax.com and put in the discount code at checkout, to obtain the discount and your Skinni Snax will be on their way.